With Lord Cutler Beckett (Tom Hollander) now controlling the Flying Dutchman and its monstrous captain Davy Jones (Bill Nighy), the age of piracy seems set to violently end. That is, unless the united pirate lords – including Sao Feng (Chow Yun-Fat), the recently resurrected Hector Barbossa (Geoffrey Rush) and the recently deceased Jack Sparrow (Johnny Depp) can unite to make a final stand. The final film of an intended trilogy has a different problem to the middle film. The middle’s problem is precisely that: it begins in the middle, runs through the middle, and ends still in the middle. Very little can be resolved, because all of the story elements need to remain in play for the climactic instalment to follow. Once you reach that final instalment, there is suddenly nothing much to do but wrap up plot elements and bring things to a close. At World’s End does precisely that, but it does take the long and complicated way around while doing it. At 169 minutes including the end credits, this is an action film for which the term ‘bloat’ seems invented. One pitfall this third film manages to avoid is the problem of re-introducing Jack Sparrow to the narrative. We know exactly where he is from the outset: dead and consigned for eternity to the mythical Davy Jones’ Locker. This therefore frees the film up to dive immediately into rescuing him from the afterlife with a mysterious map charting the route beyond the physical world and a borrowed Chinese junk on which to make the journey. It is a neat first act, and one highly reminiscent of Return of the Jedi‘s rescue of Han Solo. 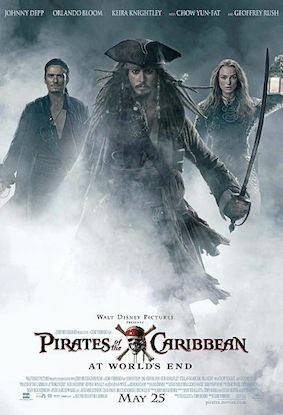 It sets up a new team of pirates led by Barbossa in concert with Will Turner (Orlando Bloom) and Elizabeth Swann (Keira Knightley). It establishes some of the film’s key emotional struggles: chiefly that Will and Elizabeth are drifting apart due to misunderstanding and circumstance, but also that the pirate lords of the world must unite to present a proper defence against the East India Company. It even introduces a new pirate captain in the shape of Chow Yun-Fat’s criminally under-used Sao Feng. The Locker itself is a weirdly self-indulgent Gilliamesque masterpiece, with multiple Sparrows, rocks that transform into crabs, and the Black Pearl seemingly stranded in the middle of flat, featureless desert. It is an intriguing representation of hell: a ship with no ocean to sail on, crewed by 30 different versions of the same man. Hell for Jack Sparrow, it seems, is not other person but simply himself. Visually it is remarkable. Tonally it pushes At World’s End even further into the realms of fantasy. By the film’s exceedingly over-the-top finale, it feels close to an aquatic Lord of the Rings: sea people versus pirates, an undead captain surviving with his heart in a box, and a vengeful goddess creating whirlpools and storms in an attempt to kill damn-near everyone. The amount of CGI used in the film vastly exceeds that if its two predecessors, and that gives the film a more less realistic, more glassy look. It is the same problem that affected Peter Jackson’s Lord of the Rings trilogy: the larger the scale of the conflict, the less realistic it becomes. There is still plenty of outstanding material on show, but there is a law of diminishing returns. It feels as if each Pirates instalment is a little less impressive than the last, despite repeatedly becoming bigger, more elaborate and more inventive. By this third film it does feel like a bit of a mess. Both Orlando Bloom and Keira Knightley feel particularly strong this time around, in part because each character gets their own distinctive trajectory through the story. For Bloom that means Will betraying his companions to save his father’s soul from the clutches of Davy Jones. For Knightley it means Elizabeth becoming a fully-fledged pirate captain as she had always dreamed. The film does an excellent job of concluding their stories in a satisfying yet slightly unexpected fashion, combining both happiness and sadness in one. Many of the supporting characters are also well treated, including Commodore James Norrington (Jack Davenport), “Bootstrap” Turner (Stellan Skarsgård) and Davy Jones (Bill Nighy). The character of Tia Dalma, played engagingly in Dead Man’s Chest by Naomie Harris, gets both a massive increase in material and a sharp change in tone; she adds to the generally bleak tone of the overall film. As for Johnny Depp as Jack Sparrow, the exaggerated performance from the second film continues – although at least in this case there’s a more appropriate and off-kilter film to contextualise it. Hans Zimmer’s orchestral score is fantastic, and to my mind the best of the three films. Not only does it maintain the key musical themes, it adds two or three others that weave in and out providing further depth and emotion. He also throws in a few unexpected curveballs: the electric guitar-dominated western showdown music at one particular confrontation is a delightful surprise. At World’s End does provide a satisfying conclusion to the overall trilogy, however when all is said and done the first film of the three really does stand up much better as a self-contained piece. The second and third films feel like a pleasant encore, but they simply cannot match the purity and storytelling efficiency of the original. In the specific case of At World’s End, while there are stunning action beats and images the scale and the length of the story let the film down. There is a much tighter, faster climax somewhere in the material, just waiting for a more disciplined director to slice away the fat.